To enhance students’ global awareness and facilitate cross-cultural exchange, we are very pleased to have several special guests from the Donghua University (DHU) to answer questions proposed by FASH455 students regarding the fashion education in China. Donghua University (DHU), located in downtown Shanghai and formerly known as the China Textile University, has one of the oldest and most prestigious fashion programs in China. Luo Wang: a Ph.D. student at the College of Fashion and Design at DHU. Luo received her B.S. in fashion design and engineering from DHU and was an exchange student at the North Carolina State University, College of Textiles. Caixia Chen: a Ph.D. student at the College of Fashion and Design at DHU. Caixia received her B.S. in fashion design and engineering from DHU as well. Her research interests include fashion marketing and fashion supply chain management. Zongyu Xiong: an M.S. student in the College of Fashion and Design at DHU. Her research interests include cost management in the fashion supply chain. Jingjing Wang: a freshman majoring in Fashion Design and Engineering in the College of fashion and design at DHU. Bai Li: Bai received her B.S. in fashion design and engineering from DHU and M.S. in Fashion and Apparel Studies from UD. Currently, Bai is a Ph.D. student at UD studying functional apparel design and physical therapy. Question from FASH455: Why do you choose to be a fashion major—personal interest or guaranteed job offer? Luo Wang: For me, it is personal interest. Both my bachelor and master degrees were in fashion design. I was interested in the development of the luxury apparel market in China. As China’s economy continues to grow, I have been studying the purchasing behaviors of Chinese consumers for apparel as well. Zongyu: Personal interest is the main reason above all. And I also hope that I can engage in fashion-related jobs in the future. Jingjing: I choose to be a fashion major because of my personal interest. But my future work may not be in the fashion area. Bai Li: Both–personal interest in fashion and a kind of guaranteed job offer because of the engineering component of the major. Question from FASH455: What classes do you take as a fashion major in China? Luo Wang: At the Donghua University, we have two departments in the College of Fashion and Design. One is fashion design, and the other is apparel engineering. I was a design major. For my undergraduate studies, I have taken Design Introduction, fashion design, pattern making, Apparel Production, and Marketing Management, Apparel Making Basic Techniques，Fashion Illustration，Computer-Aided Fashion Illustration，Apparel Making Techniques，Apparel Accessory Design，Clothing CAD，Apparel Accessory Design. For my graduate studies, I have taken Branded Fashion Exertion, Fashion Accessories Art Design, Design management, History of Art Design, Branded Fashion Design, Fashion Brand Constitution, Fashion Comments, Western Modern Art, and Western Art Literary Theory. Caixia: Fashion marketing, fashion manufacture management, fashion buyer, fashion English, Fashion trade, fashion forecasting, draping, and pattern-making. Actually, the Donghua Universty offers two fashion majors. One is fashion design which focuses on design. The students majored in fashion design are good at drawing. Another one is fashion engineering, which focuses on draping, pattern-making, fashion trade, fashion marketing etc. Zongyu: Global marketing of clothing, Market research and forecast, Consumer psychology, Clothing Materials, CAD, Fashion Illustration, Clothing craft, Draping, and some theoretical course. Jingjing: So far I’ve taken clothing marketing and merchandising, garment production management, fashion retail management, etc.. Question from FASH455: What is the percentage of fashion majors in your school that receive job offers immediately after finishing their studies? Caixia: As I know, around 100 fashion engineering majors graduate from the college of fashion and design at DHU every year. Among them, about 50% receive job offers immediately after finishing their studies, and about 20% will continue to pursue a master degree in China. Another 20% will choose to study abroad. Zongyu: According to the official statistics released by DHU, the employment rate reached 92.18% for the total 729 class of 2015 graduated from the college of fashion and design. Question from FASH455: How do your professors tell you about the fashion industry in the United States? Luo Wang: We were told that a notable competitive advantage of the U.S. fashion industry is in marketing and business strategy. As we know, U.S. has the world’s top business schools and MBA programs; I think this is why our professors told us we need to learn more about the business strategy of U.S. fashion companies. Caixia: U.S. is one of the largest textile and apparel importers in the world. China — by far is the largest supplier of textiles and apparel to the U.S..
Zongyu: I’m sorry for my limited knowledge. I just know a little about the recent trend of American textile industry moving back to the U.S..
Jingjing: The fashion industry in the United States is quite developed, and it has an important place in the world. However, it also meets bottlenecks at its present development stage. Some classic brands are managed less well than in previous years. Bai Li: Not much…some professors had limited knowledge of the fashion industry in the States. Question from FASH455: How do you think globalization has affected China, especially its textile and apparel industry? Luo Wang: In my opinion, globalization is a double-edged sword that brings China both changes and opportunities. The low labor cost was a significant advantage of the apparel industry in China. With the deepening of globalization, however, China has been strengthening the enforcement of regulations in the social aspects, which focus on improving worker’s welfare and meeting the international labor standards. As a result, China is gradually losing the advantages in labor cost compared with many other developing countries. On the other hand, an opportunity for the apparel industry in China is that we begin to pay more attention to the building of our indigenous fashion brands rather than making knockoffs. Caixia: It is of grave concerns to some Chinese manufacturers that more and more international buyers now switch to source from lower-cost countries such as Bangladesh and Vietnam. However, in my opinion, Chinese manufacturers still enjoy competitive advantages. For example, Chinese suppliers can provide better quality products and more value-added services. 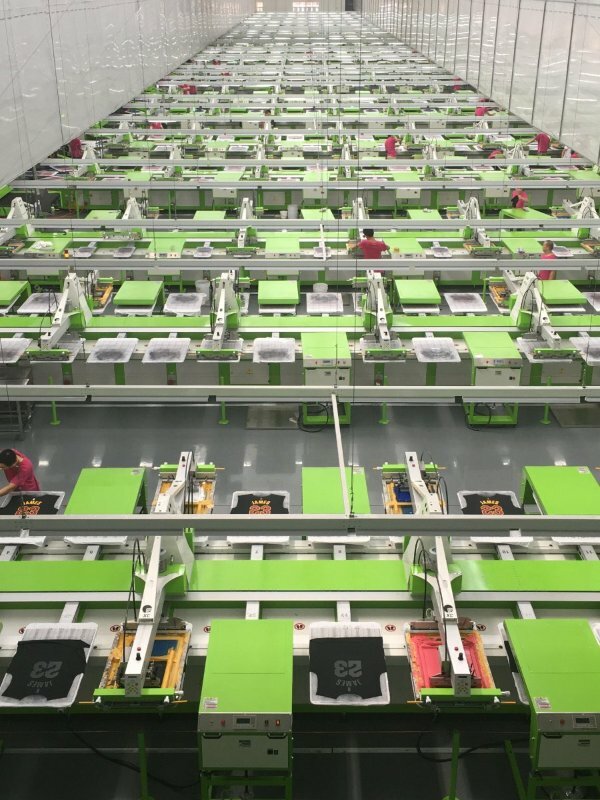 Furthermore, by adopting new technologies, Chinese factories are able to offset the impact of increased production cost through improved efficiency and product quality. On the other hand, globalization has made it more difficult for Chinese fashion companies to develop its own brands. In particular, the local Chinese fashion brands are facing grant challenges with the flood of international brands into the Chinese market. Zongyu: For Chinese companies, globalization not only has resulted in more competitive pressures but also has created more opportunities to get access to the world marketplace. Chinese companies realize that they have to embrace a global version and develop high quality and innovative products so as to stand out from the market competition. In terms of the Chinese consumers, globalization has brought them with more choices of better quality and lower-priced products. Jingjing: Globalization is a two-edged sword, creating both opportunities and challenges for China. In the past, low-cost labor is a major competitive advantage for China. But now China’s cost advantage is gradually diminishing compared with other less developed countries whereas China is still not “strong enough” to compete on technology with advanced economies. Bai Li: Of course, globalization has created many new job opportunities in China but also has caused some labor and environmental issues. Questions from FASH455: What are the working conditions of garment factories in China? Caixia: The working condition in China’s garment factory has improved significantly as you can see from the pictures below. Automation and technology advancement also play an important role. Zongyu: Dragons and fishes jumbled together, meaning there are companies in either good or bad conditions. But compared with the past, working conditions in the Chinese garment factories overall have much improved. Most factories have met the 5S (5s is the name of a workplace organization method that uses a list of five words: sort, set in order, shine, standardize and sustain) or 6S(5s plus safety) requirements. Jingjing: Following the principle of 5s management, Chinese garment factories overall are getting cleaner, more orderly and more modernized. Question from FASH455: Does it bother the Chinese people that American companies send work to China to produce cheap labor? Zongyu: It is just my personal view: exporting textile and apparel is necessary for China as a developing country to generate economic growth and create job opportunities. But China is also transforming and upgrading its economy. Jingjing: I think it is a normal phenomenon in the developing world. Actually, Chinese companies have started to offshore production to less developed countries with cheaper labor. Anything else you would like to share with our students? Luo Wang: As a pillar industry supporting China’s exports and foreign exchange earnings, the textile and apparel industry is a sector of strategic importance to China’s national economy. You can find the world’s most complete textile and apparel supply chain in China, from material planting to retailing. I would strongly recommend you to come and visit China, from its garment factories in Guangdong province (located in the South Part of China), online apparel retail businesses in Zhejiang Province (for example, Alibaba), to Shanghai where you can enjoy the most novel way of clothing shopping. Further, in today’s supply-chain based economy, China plays a critical role in linking the textile and apparel industry around the world. I am sure understanding China will help you shape a big picture of the global textile and apparel industry and beneficial for your future careers. What do Americans think of “Made in China” today? Do the classes you take help with your career preparation? Have you taken any internship classes at UD? What did you do?